Albannach are pleased to introduce you to our very own tartan. In conjunction with Rocky Roeger at USA Kilts we have worked to design and produce a bespoke tartan which has now been registered as the official Albannach Tartan which we will be wearing at our gigs and performances. The Albannach tartan was designed specifically for the band and our fans, to celebrate our love of Scotland. The threads in the “Saltire” section add up to 13 and the red threads add up to 14… these “Flag and Blood” sections are 1314, the year Robert the Bruce lead at Bannockburn to re-establish Scotland’s independence. As a kilt is a custom-made garment, all orders for Albannach kilt wear will be taken and processed by USA Kilts, who will take all of your measurements and hand-make your kilt to order. 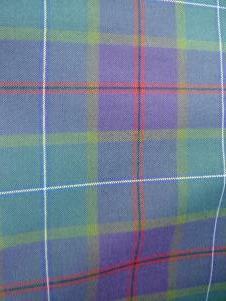 Ordering is subject to limited availability of our tartan.